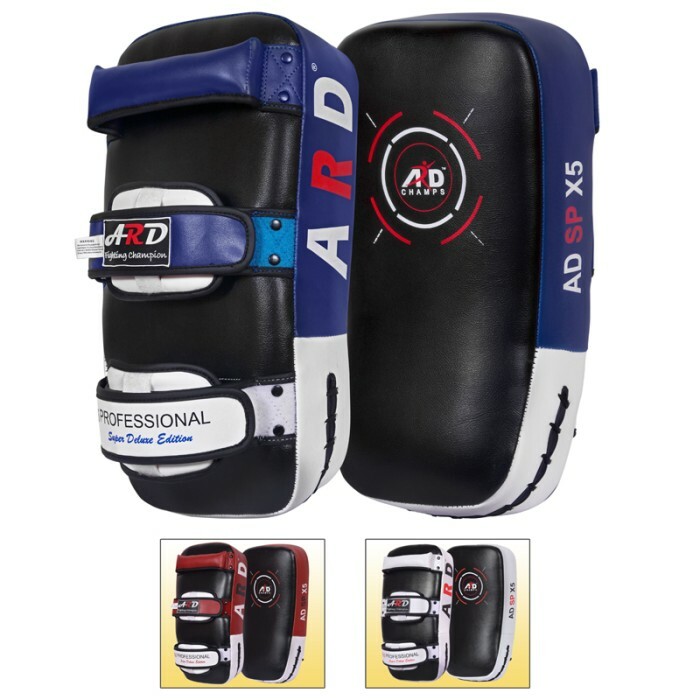 ARD Champs Creative Curved Style Quality Leather Art Boxing Thai Pad Excellent Quality with IMT Gel Integrated inside 3 Layers Foam The Professionals Last Best Experience. We ensure the ARD Leather Art Boxing Thai Pad meets your expectations perfectly as you try it by yourself with confidence. ARD Head Thai Pad made with top quality Leather Art filled with IMT three layers of Gel Integrated thick foam for heavy duty shock absorption, high density foam to take the most grueling hits to the front that easily absorbs full contact strikes and the double layered webbing, re-enforced buckle straps ensures a more secure fit. The cushioned wrist area with reinforced handles and two Velcro arm straps for closing for best grip. Also features the new Aero Punch technology, due to its molded foam structure it absorbs shock waves more evenly therefore reducing the risk of strain injuries that may occur during training. Both sides of pad showing into two different images to define the back side bidding and sold as single piece. It’s bidding for one pad only two pads shown in image to show reverse side of pad.